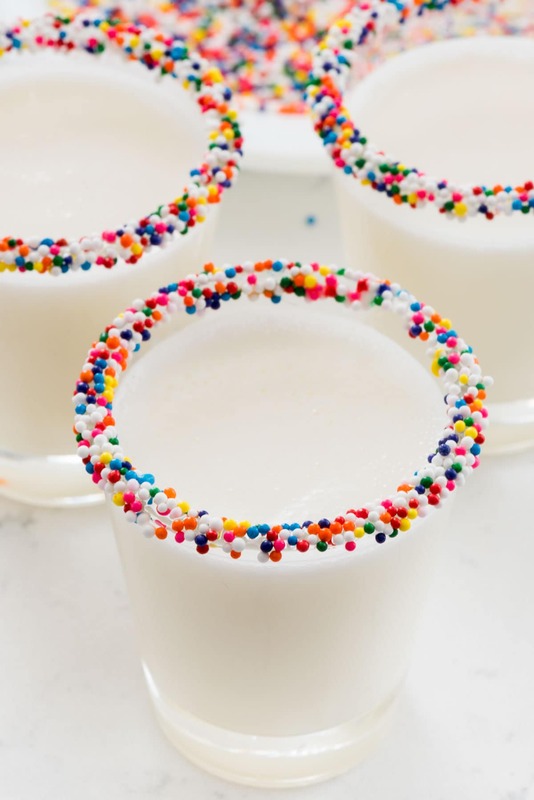 Frosting Shots – this easy cocktail recipe has just two ingredients, vodka and frosting! 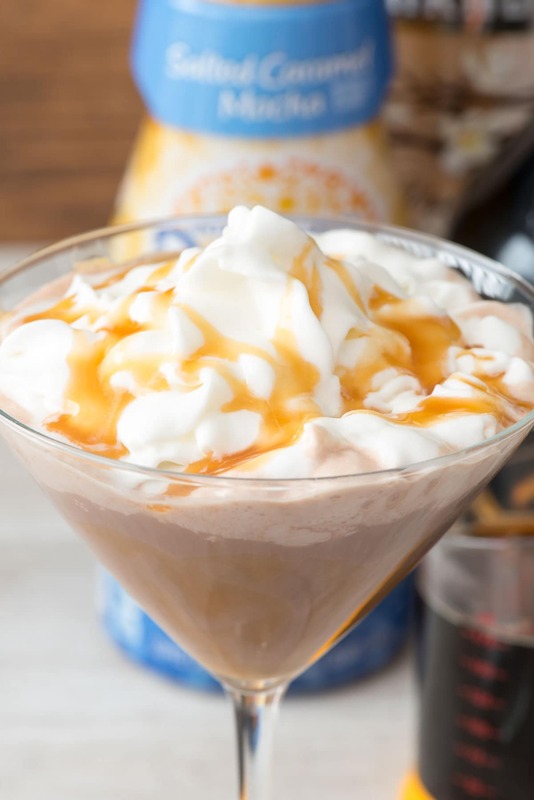 They’re the perfect dessert drink recipe, especially for a birthday. A few weeks ago, a good friend of mine turned 40 and we threw her a party with our closest friends. She’s a mom of 3 boys and rarely gets to feel girly (it’s all baseball and basketball and rough and tumble over at her house) so we pampered her with an extra girly evening full of flowers and food and fun. I was in charge of desserts for the party (obviously, when am I not?) and I made an assortment of things like red velvet cake, lemon tarts, and drunk cherries. (PSA, if you make those cherries, I urge you to re-think soaking them for a full week before serving or you will go from 0 to drunk in no time at all!) I’d originally planned to make lots of flowery decorations for her cake using canned frosting (the cake was frosted with the real stuff) but then I got lazy and did my default rosette pattern instead. I found myself with a can of frosting and as I was setting up the bar I thought…why not mix FROSTING with VODKA? These frosting shots are so easy to make, and so good – everyone loves them. The birthday girl drank more than a few! I did a few trial frosting shots as singles to taste, but I found that it is better (and almost easier) to make a few shots at once instead of one at a time. The first time I made these frosting shots, I just tried to shake frosting with the vodka, which left clumps. Then, when I was making them for the dessert table, I wanted to have several prepared at once. I decided to melt the frosting a little bit before adding the vodka and it worked wonderfully. Did you know you can heat canned frosting in the microwave and it becomes warm and pourable? That’s the consistency you want. You can also use scratch frosting, just make sure its super room temperature (or even warm it up a bit too). Instead of using a cocktail shaker, I used a shaker smoothie bottle to make the frosting shots in, or you can also use a jar. You want to shake these up vigorously to combine the vodka with the frosting. The mixture will last in the refrigerator for several hours, so you can even make them up early in the day and then just give them a shake before pouring and serving. 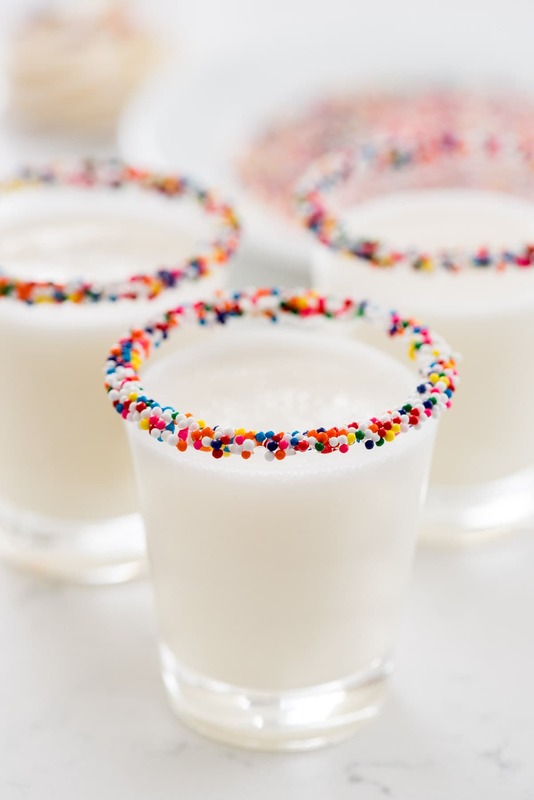 I rimmed each shot glass with sprinkles by dipping them in corn syrup first. You can also use honey or maple syrup. I suggest using nonpareils for this rather than big jimmies because they’re more dainty. Sugar would be okay too, but it’ll dissolve faster. As with all cocktail recipes, the strength of your frosting shots is personal preference. I found we preferred 2:1 frosting to vodka, but if you want it less strong, just use less vodka. It might take some trial and error to find your perfect match. I used plain vodka, but I think a flavored one would work well too. Just remember that frosting is super sweet, so a sweet vodka will just make it even more so. I want to try these frosting shots with chocolate frosting, too! Speaking of sprinkles, chocolate cake batter ice cream with sprinkles or snickerdoodle sprinkle cookies would be great to pair up with your vodka shots. Frosting Shots - this easy cocktail recipe has just two ingredients, vodka and frosting! They're the perfect dessert drink recipe especially for a birthday. To rim the glasses: place corn syrup or honey on a small plate and sprinkles in a small bowl. 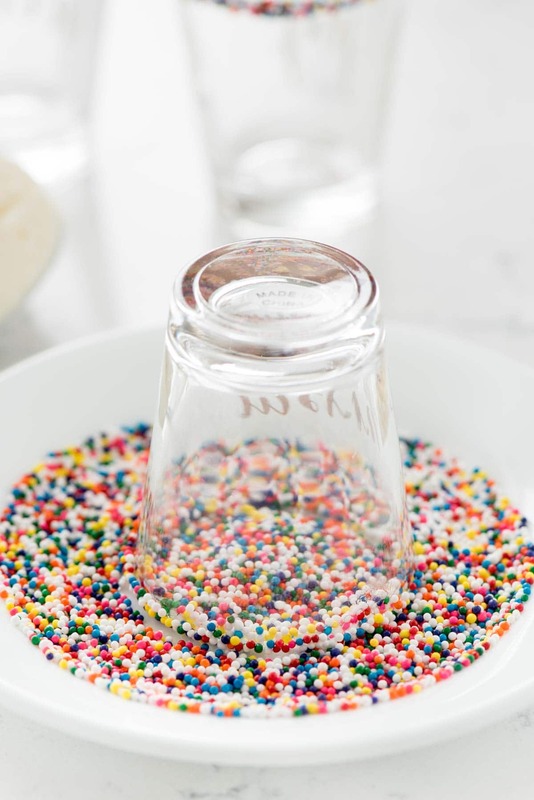 Dip the rim of each glass in the sticky syrup, then in the sprinkles. If using canned frosting, heat it until it's warm and pourable but not too hot (15-25 seconds for most microwaves). If using a homemade frosting, make sure it is very room temperature and smooth. Pour into a jar or something with a tight fitting lid. Add the vodka, then seal and shake vigorously, until the frosting is mixed with the vodka. Pour into glasses and serve. You can also let this sit for up to 3 hours, then shake and pour before serving. They'll last in the glasses at least an hour before starting to separate. These are brilliant! They scream fun and what more could a birthday girl want than that? Love this idea and have a few birthday parties coming up. Bring on the sprinkles. Genius idea and this is my idea of how to repurpose odds and ends baking extras, like an extra jar of canned frosting! 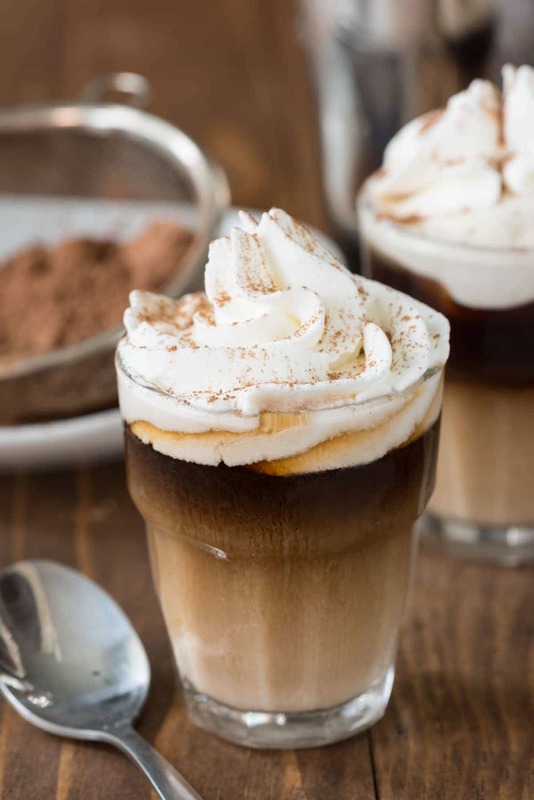 I know that it melts in the micro – I have done that and poured it over cinnamon rolls 🙂 I want to come to one of your parties! Wow. Wow, if I was a drinker this would be my drink! I’ll take two, please! 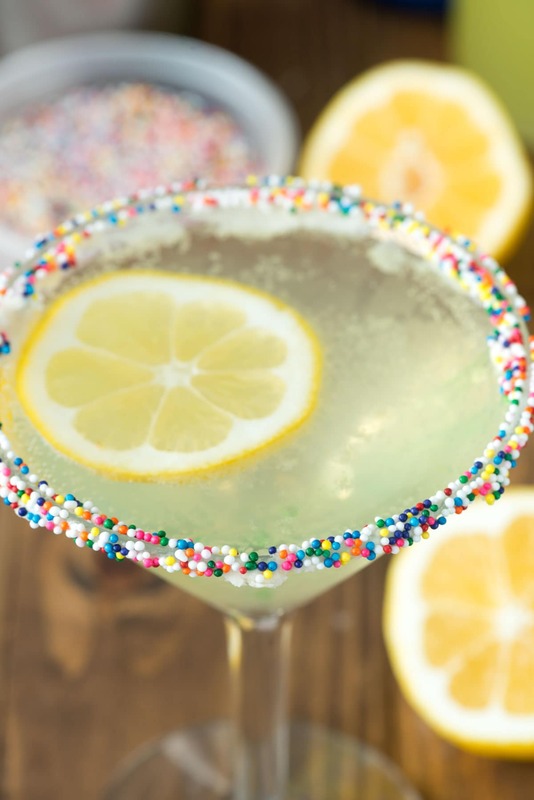 Frosting + sprinkles = my kind of drink! These were such a hit! So delicious and festive! Can’t wait to make them myself! Thanks for being a genius! These look so dangerous, but so much fun! Sharing!